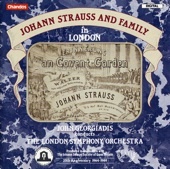 Johann Strauss and Family in London was recorded in 1989 as part of the Society's Silver Jubilee celebrations. It features works associated with visits made by members of the Strauss family to England. This recording is by John Georgiadis and the London Symphony Orchestra.